Over two years after Fordham University refused to recognize a prospective chapter of Students for Justice in Palestine on the basis of its political beliefs, a group of students continues to fight the school’s decision in court. But over a year after asking a Manhattan judge to order Fordham to recognize the chapter, three of four student petitioners have graduated awaiting the court’s decision, with the final petitioner set to graduate in May. In February, a new generation of Fordham student sought to join the lawsuit. Petitioners moved to amend their complaint to add to the case sophomore Veer Shetty, who wishes to join a recognized SJP chapter at the university. Shetty’s addition to the suit would help keep it alive once all current petitioners have graduated, preserving the chance for current and future students to have a chapter, even if the original applicants never enjoy the benefit of their fight. In a March filing, however, Fordham opposed the move to bring Shetty into the case, likely aware of its chance to let the slow-turning wheels of justice render the lawsuit moot if the sophomore is blocked from joining. The students’ lawsuit argues that these promises, codified in Fordham’s policies, are binding on the university. By failing to follow its own rules, they argue, the school violated state law and must be ordered to reverse its ban on the SJP chapter. As petitioners point out in their reply to Fordham’s opposition, the university’s argument that Shetty “can simply submit an application for a different club that it might approve entirely misses the point … . Mr. Shetty, like Petitioners before him, wants to be a member of a group called Students for Justice in Palestine, which is what Fordham refuses to permit.” Indeed, the petitioner students’ desire to convey a specific political message through affiliation with a particular movement — and Fordham’s concomitant suppression of that message — is the very heart of the lawsuit. It seems nothing has changed since Fordham’s brazen censorship of SJP earned it a spot on FIRE’s 2017 list of America’s 10 worst schools for free speech. 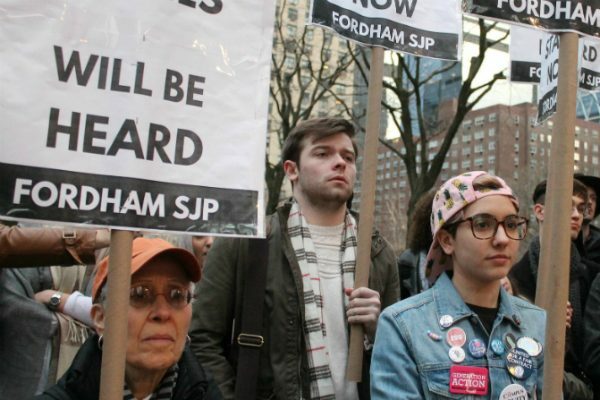 We’ll continue to follow petitioners’ long-running court battle and hope to report that justice delayed does not become justice denied for the next generation of Fordham students hoping to join a recognized SJP chapter.